Ask any marketer about trends for 2011 and you’ll undoubtedly hear the phrase “location-based services.” However, among Foursquare, Facebook Places, SCVNGR, Gowalla and many others, marketers have a lot to choose from. In this article we’ll cover the two major players—Foursquare and Facebook Places—and see how they stack up. Location-based services allow users to connect with others based on their current locations. In most cases, people use their smartphones (iPhone, Android, Blackberry) to “check in” to businesses like restaurants, bars and stores they visit. These locations are then broadcasted to their online friends. Many of these services also have a gaming component, allowing members to compete against one another or to collect rewards (like online badges) for their activities. Foursquare offers badges that are unlocked as an incentive for checking in at local venues and events. So why do marketers love location-based tools so much? Because each check-in is broadcasted to a user’s friends, there’s natural word of mouth advertising that occurs through the site. Marketers’ theory is that if users see their friends check in to a location, they may be more likely to visit. Most location-based tools allow users to write reviews of the places they frequent. These reviews are then shared with other users who check in to those locations. This can have a real impact (either positive or negative) for businesses hoping to be discovered by new customers. Sites like Foursquare and Facebook Places allow businesses to run specials that are unlocked by users who check in to their locations. For example, a pizza place could create a special that gives free breadsticks to customers who check in five times. These specials encourage frequency, first-time visits and competition among customers. More on this later. Now let’s compare the two major players—Facebook Places and Foursquare. In 2010, Foursquare announced that it had more than 6.5 million members worldwide. Facebook, on the other hand, said that as of October 2010 (just two months after its launch), more than 30 million had tried its Places service. It’s unclear how many of these users can be considered active versus simply setting up accounts. But based on download volumes, it’s clear that Facebook made a big splash upon its launch. In 2010, Foursquare claimed that its users checked in to locations more than 380 million times. Facebook has not yet released its Places check-in numbers. But Business Insider (2010) recently ran a one-month comparison between the two services, looking at the difference in total check-ins at several popular NYC restaurants. Business Insider found that five times as many users checked in on Foursquare than Facebook during a one-month period at a NYC restaurant. Foursquare overwhelmingly dominated in the experiment, with 5x (or more) the number of check-ins in some cases. It’s unclear if these numbers apply to all businesses in all cities, but Foursquare users appear to be far more active than Facebook Places users. As mentioned, both Foursquare and Facebook Places encourage businesses to create specials that reward users for checking in to their locations. But options for these specials vary slightly per site. For example, as part of its “Charity Deals,” Facebook lets businesses donate a certain amount of money per check-in. This type of special is not currently available through Foursquare. 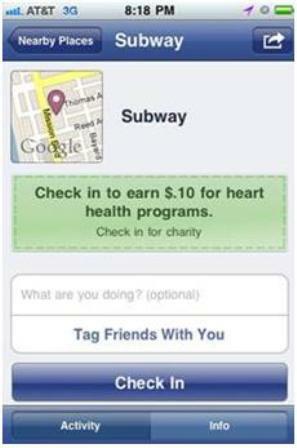 Subway recently offered a Charity Deal on Facebook, offering $.10 per check-in to promote heart health. 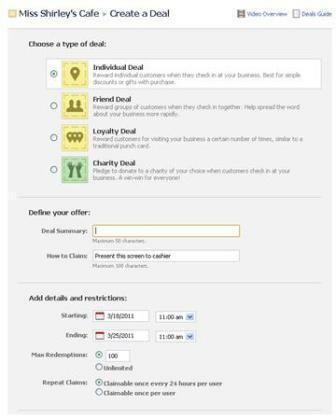 Using Facebook Places Deals, businesses can choose to offer one of four types of deals and can set restrictions on date, time and availability of the deal. Foursquare is also in the midst of expanding their check-in deal options for businesses to better compete with Facebook, so you’ll begin to see a lot of overlap between the two. One of Facebook’s key advantages over Foursquare is its large, built-in network of users (600 million+ of them!). And because Facebook launched long before Foursquare, many of its users had time to build up their own networks of friends. In fact, the average Facebook user is connected to 130 friends. This means that on average, each Facebook Places check-in has the potential to be seen by 130 of a user’s Facebook friends. Foursquare users appear to have much smaller networks, and thus a much smaller reach. The site doesn’t appear to disclose data about the size of its average user’s network. But anecdotally, it’s hard to find many users with more than 50 friends, meaning that each check-in may be seen by just a small group of users. The majority of Facebook users are connected to their intimate social networks—friends, family, co-workers, etc.—while many Foursquare users are connected to those they’ve never met (e.g., Twitter followers). From a word-of-mouth standpoint, it can therefore be argued that Facebook check-ins are more valuable than those spread strictly through Foursquare. It’s the difference between telling your best friend where you’re hanging out versus telling a complete stranger. Your best friends are going to be far more likely to trust your recommendations. Facebook check-ins are published on the user's wall and unlike Foursquare, Facebook Places allows users to tag a friend in their check-in. Foursquare offers the option to post check-ins to users' Facebook walls and Twitter feeds. Please note that Foursquare users are able to share their locations to Facebook and Twitter, but very few choose to do so. Looking to increase foot traffic? Want to see your regulars visiting more often? Before you launch your first Foursquare or Places special, be sure you’ve defined what you’re trying to accomplish. This will help you to better analyze your results and adjust your campaigns as needed. As with most social media tactics, it’s important that you first understand the tools from a user’s perspective. Doing so will give you better insight into how and why your customers are using these tools, and may give you insight into what your competition is doing. Sometimes the best ideas can come from the least expected places. So before launching into a large location-based campaign, make sure you know what others are doing out there. Take a look at your competition, obviously. But also venture outside of your industry. You never know when you’re going to stumble across the idea that kicks your brain into high gear. The biggest mistake you could make in launching a special would be to do something that’s already being done. Find something that’s going to make people turn their heads. Something that makes them say “Huh?” And, most importantly, something they’re going to tell their friends about. If you’re not excited about your deal, they probably won’t be either. Once you’ve launched a promotion through Foursquare, Places or any other location-based network, make sure you get the word out. These technologies are still relatively new for most consumers, so there’s a certain level of education that has to go into making these things successful. So upon launching, make sure you have in-store signage to promote your special. Send out an email blast with information on how to use the sites. And if your special is unique enough, send information out to local bloggers and media. There’s no cost associated with setting up a profile on Facebook Places or Foursquare, so if you’re looking to launch a location-based promotion, there’s no harm in giving both a try to see which service generates more buzz and drives traffic to your business. Just consider the above tips before you launch your campaign.